I find using my Indeed app absolutely OUTSTANDING!! Best Job Search Engine EVER!!!! New jobs remain showing all day long. It was better before recent update! Always have jobs for everything. This is a tragedy. In a world of increasing privacy concerns, these people wont let you connect unless you turn off your VPN. UNINSTALLED . Great app but there needs to be a way to download a PDF or something of your resume straight to your phone! Not all of us have computer access! Usually it won’t say where the business is located which is really annoying. Usually I love this app, have used it for years no problem. When I’m trying to apply with the mobile option so I can just attach my resume, when I choose the file it closes the app down. This hasn’t happened until this latest update. Very annoying so can only use my phone to look for jobs now, not apply. I’m starting to receive lots of spam messages, please give options to delete and flag messages. 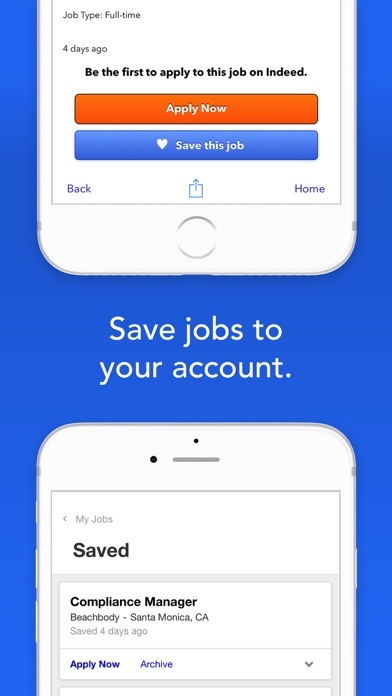 Simple, to the point and not misleading like almost every other app that claims to assist you in finding a job. Thanks indeed! Although you must pay attention to when the job was posted, Indeed really does help connect the dots. I have had more engagement and interviews since I began fully utilizing Indeed. I do not like the prescreening tests, because they are generic and subjective, but the overall experience has been good. I recommend Indeed for anyone willing to engage their process for finding a job. You will see results. Thanks Indeed! Sometimes after being in a while it won’t work but uninstall and reinstall. Luv luv luv Indeed!!! Fastest way to connect to job offers. Every time I try to click on a job it’s telling me to Retry over and over again. I close the app to see if it would work but still doing the same thing. Please fix!!!! 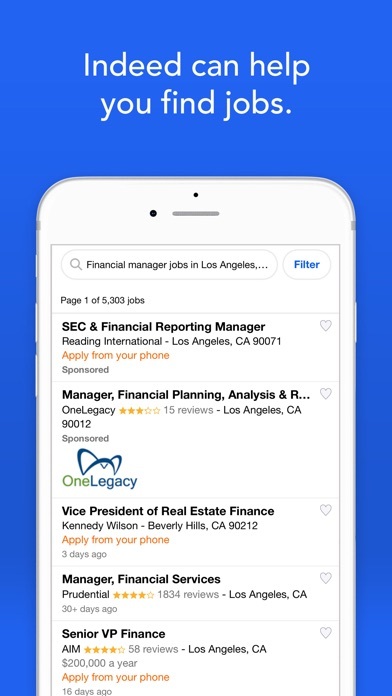 Cool app... would be nice if we can swipe left to delete jobs from our search that we are not interested in or apply to our job search... or even those we’ve already applied to. Performs great except for the fact that I get logged out every time I leave the app. After asking me to log back in I must verify by text each time I want to log in, very annoying. Also I noticed that I can’t save my resume onto my phone unless I take a screenshot, that isn’t very professional. If you could fix those two issues the app would be fantastic! I love the Indeed App. I find it very useful. My only disappointment is that you cannot email your resume from it as before. If that function is put back, I would give Indeed a 7 star rating. Most Professional and organized app. No junk or spam. Highly recommend. Only low paying jobs pop up. I search for a specific amount and it goes back to the garbage $15/hr jobs in locations nowhere near me. It would be nice if employers were required to get back to you. Sometimes I apply for jobs and never hear anything back. In the world we live in it would be nice to know where there is lack in a resume to be able to be more employable or understand why they arn’t getting hired. Applying for jobs is time consuming and sometimes very rigorous. In the last week I have applied for over 100 jobs, and only one employer actually responded. The best source for looking for work. Through Indeed.com I was able to find a recruiting agency who found my resume and placed me with an ideal career. I recommend using Indeed for all jobs/career searches; it’s the best and all employers use this site for all their future and potential candidates. This works, for the most part. But I wish the search tools matched the desktop version - specifically the option to exclude postings from staffing websites. Best place to look for a career! No one has reached out to me and I have applied to many jobs it just feels like I’m wasting my time. Good app. Needs a bit. Good basic job app. Needs to have easier ways to post your resume from the app, on mobile. Very informative and easy to navigate. Hoping to get an offer from applied jobs soon. Indeed is one of the best job recruiting website online. I applied for a job and that same job called me back to set up a interview 5 minutes later. Indeed is cool to use on the mobil app but I feel like it’s not really user interfaced friendly. Very generic used and needs help. It’s great to have Mobile Apply jobs and you can do it right from your phone. The app is decent. Clean look, navigation is straightforward. The search algorithm, tho', is a little wonky. Either the factors for assigning relevance are way off, or the sort for search results missed a memo. The email alerts algorithm is totally out of the loop. On average*, 6 out of 10 jobs it sends aren't even close, regardless of the alert criteria. *I went through three months' of emails. Enjoy looking at the jobs. Some are very interesting. I find indeed to be extremely helpful. I Thank you for your service. Best job finding site available ! Every time I try to click on a job it’s telling me to Retry over and over again. I close the app to see if it would work but still doing the same thing. Please fix! I’ve never found a job from help of a website or a app. But times are changing and I’m a busy individual. This app seems to have a pretty big range of professions, jobs I haven’t seen in other places. But I’ve yet to find work, and that’s the whole purpose of the app. I’ll revisit the review if I find work here. Great search engine, needs to include salary. I really dislike the fact that I can’t search jobs based on salary anymore. It makes my search incredibly less efficient. I know what I’m looking for and not having that key part of information as a searchable criteria makes me not like the app as much. Outdated constantly, littered with scam and the majority are all staffing agencies very little postings from actual companies for employment. I’m not in a major metro area, it’s not some out of the way place either. I have not had any success with my search in the years I have used this app. For the record I’m not unemployed luckily; I have been searching for a new company that has growth potential for my career as the one I have been employed at for over a decade has become stagnant. 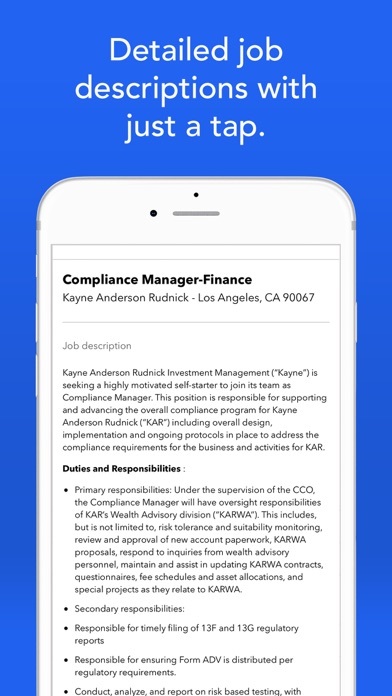 Amazing app, compacted with many specific job details. Easy search engine that delivers results by area or zip code. Detailed information about companies work environment and pay scale, reviews from current and past employees that give you a better understanding of the company you may have interest in. This app is a must have for any employee. I tried to search for a specific title and salary in the app and received zero results. Exacted the same search on a desktop device and received several results. The app is broken. So first thing is first ive applied to over 150 jobs have a bachelors degree and over 10 years of experience but yet i cant even get calls from any employers in the san diego county area. But i do in bigger cities like San Francisco you would think that the companies in San Diego would call for at least an interview then i got word from several latin educated people who also have the same problem and we are thinking that in the corporates world in San Diego there gas been racial discrimination since most employees they hire are white. This is a huge problem that needs to be addressed and is illegal bc over 10,000 people that i have spoken to in social media or in person have complained above employers in San Diego not calling them even for an interview when they more then qualify but do not call bc they have a hispanic last name!! Awful, doesn’t work at all. The update emails are more then 5 days old usually over a week old. So, that limited and narrow down my opportunities. I haven’t been hired yet off it but I know soon. App has a lot of issues, states has new positions available, in reality it’s the same job postings from months ago also employers don’t respond to messages makes it seem questionable if actual employers are recruiting. I will give the website/app more stars when I get an interview. The best job app ever!!! i like the app and i have gotten my first interview already after just recently applying to a few a few days ago but... i keep having to sign in! it’s frustrating! App updated, wi-fi on, data on, still 'Fails to connect to Indeed' Interface is a bit dated but wouldn't mind it if anything actually loaded. I have always used Indeed for posting my resume and searching for jobs for many years. I recently got laid off from a current job (which I found through the site) and i turned to Indeed to help me find something. I applied for many positions and revamped my resume. Yesterday I had three interviews from postings I applied to from Indeed, and two different schools have contact me through the web site. I even found past jobs through Indeed. Its such a life saver and I couldnt reccomend it enough. This is the only site/app I will ever use to find jobs and to contact different companies. It’s an awesome app but when I get “new” listings, they’re literally just repeats of jobs I’ve seen a million times. It needs helps. I did get an interview and I got a job I’ve been at for a year now so yeah. App used to be great, now it’s garbage. When I click on a job listing I either get a list of previous searches or the info from a previously viewed listing. Consistently see the same job on every page of search even though not related to search ie: truck driver when searching for financial positions. Will list same 3 jobs on every single page - not all advertised. App will not allow search to go beyond 7-8 pages even though lists 100+ pages. Consistently gets stuck on on job and can’t go back. Saved jobs will not always appear as saved. Decent for job search but has its quirks that make process more complicated. This application is so frustrating. I’ve applied over 200 business with no call backs. I live in an area where unemployment is unusually high. I just don’t understand how EVERY business can look at a resume and literally throw it in the trash. I do not agree with how this app let its business owners treat the applicants. Negative 5 stars for this app. Making me sign in every two seconds and keeps telling me to upload a resume when I already have an indeed resume. Started happening after updating. I wish this app would organize itself a little better. Like out jobs you’ve already visited lower on the ‘new’ list (because I’ll look at a job and four days later it still shows under new). And I also don’t like that you can accidentally click on one job and it’ll start popping up and sending you emails about other jobs like that. Accidentally clicked ‘forklift driver’ ONE TIME and now it’s every other job. They present job opportunities, that mostly fit my capabilities. Sometimes it’s difficult to find any contact information to reach the employer in order to follow up with a CV. Especially if the employer is a multinational, or a small, local business. If you can find a way to fix this problem, that would be great, and I’ll change my rating to a five. My solution to this problem would be to require the employer to list contact information on their indeed accounts, but that may be just a little too much to ask, but nonetheless it’s a possible solution. Love this app but I have been frustrated since I can’t filter my results. I can’t even separate old postings from new ones. Maybe I am missing where that is done on the app but, I am positive that I cannot find it. Great platform for connecting career minded entrepreneurs looking for work contracts. Leave the monster and headhunter services alone and try this. You’ll find willing employers genuinely seeking talented people for mid to high paying employment. I love that indeed has an app but I really hate how it logs me out ALL THE TIME. Can anyone fix this please ! I hate having to log in every single time I go on my app. I've have had many interviews with this app with many different hiring managers getting back to me as soon as the next day or following day after I apply with this app. Reasoning for giving four stars instead of five is with the recent update it is giving me a hard time to apply. A pop up would show and mention that I need to connect to indeed to apply and there's options for retry, setting, and cancel. I have to press retry multiple time before it goes through to apply for a job. At this point in time until this gets fixed I will be using the website instead. Until then indeed app I'll be back. I have been on indeed for a long time and don’t get as many call backs like the other website. I love this app, it is very useful. Lately it only works sometimes. I used it yesterday and when I tried to open the app today it said server unavailable. App has a lot of issues, states has new positions available, in reality it’s the same job postings from months ago also employers don’t respond to messages makes it seem questionable if actual employers are recruiting.. I couldn’t even finish registration process! Very useful app. Easy in use. I have three interviews and I just downloaded the app last night!! “Entry level” needs 2 years experience? Very helpful and efficient! Making looking for a new job/career easier and not as dreadful! I love being able to apply for jobs easily like this! If I can figure it out so can you. This is better than going door to door for sure. I’m traditional, but this is very convenient for getting my foot in the door at a business who’s actually wanting me to be there. Rather than me just barging in with a resume after applying online last week somewhere else... Thanks Indeed! Indeed has made an app that is easy to use, helped me apply to jobs easier, and is all around a good experience. I’d like to see a feature to allow the user to download their resume from the app though. It is nice that we can edit it, but when recruiters have you apply on their website instead of on indeed it can be frustrating not having the resume handy. Need to check or do backgrounds checks on jobs before they can put out applications . There are a lot of scammers on indeed who post fake jobs and will accept you once you’ve applied only to send you fake checks and try to ruin you finances and waste you time. Be very careful what jobs you apply to and who provide you information to. Indeed will not take any responsibility for these scammers, they will apologize for the incident but will not take precautions towards limiting fake employers and fake jobs. My advice is to apply to a job through their website, if they don’t have a website, don’t apply through indeed. I almost got scammed for more than $2000 Be especially careful of positions titled data entry, and assistant. Also be careful of remote jobs. Many of them are fake and are liking to get your information so that can take out money from your account. This WAS a great app but there’s so many bugs recently, the worst of which is not being to save favorites. I love indeed. It’s fast easy and best of all free!! I like that they really match you to great companies. Indeed has gotten me every job I’ve had since a teenager. I love that they have an app that’s easy to use! When I was in highschool I got my certified Nurse assistant and when I turned 18 I literally applied everywhere that took Nursing Assistants. I went on multiple interviews and everywhere told me the same thing we want someone with experience. It’s hard to get experience when no one will hire you. I found the perfect position with indeed for an agency looking for nursing assistants for immediate hire no experience needed. I got my 2 years experience and now I’m working in a hospital close to my house and have experience with every aspect of nursing. I will forever encourage people to use indeed I love it. I would like this app so much more if it was more accurate with location....I applied to over 20 jobs that it said was near me (I wanted the ‘within 5 mile radius’ jobs) and when I get asked to go in for an interview, it turns out they’re all over 15 miles away and over a half hour drive...really inconveniencing because now I have to drive over 40 minutes for interviews and see if I can get transferred. You guys should fix location accuracy. Otherwise it makes applying to jobs pretty easy. Every time I try to submit my resume, the app crashes. I’m not sure why, but this issue needs to be fixed. Poor returns on job postings based on zip codes etc. The app autocorrects itself regardless of search location accuracy the applicant inputs . I literally started looking for jobs maybe 2 weeks ago tops! I applied for TWO on indeed. Got a call from one a few days later, had an interview and got the call that I got the job today! I’ve never had such an easy job hunting experience and it’s all thanks to indeed! I’m so thankful I was told to look on here! Thanks indeed! I’ve had some great luck so far! Amazing things is what Indeed as done for me! Keep it up! I do like this app, it is extremely useful, however, the one complaint I have about this app is the ease (or lack of) of use. Once you have applied for a job specifically using Indeed to upload your resume and it gives you the option to go back, it takes you to the description of the job again. The Back button does not take you back to the listings. You have to hit the Home button and start from the beginning, not where you left off. If you were on page 10, you have to go page by page to find where you left off. The app also repeats the same postings multiple times, even when you have either already applied or have saved the posting to “Your Jobs.” It’s gets very frustrating to spend an hour and a half and have only been able to apply to a handful of jobs because of having to start your search from the beginning after applying to one. If this was not an issue and I could be taken back to the place I left off I would easily give this app five stars. I find it better than the Monster or Career Builder sites. not the best but okay. I believe there should be a function that can filter out jobs for those under 18 that require you to be 18. Reason: The local lingerie store keeps wanting me to apply. As a minor this is very annoying. If I could list my age and then be able to only view jobs I can work, it would make the application process much easier. My daughter was in desperate need of a second job and used this site to help find something. She was contacted by a man stating he needed a personnel assistant for his “On Demand Plumbing” company. She researched the company and found it to be credible. Most of their conversation was through email. She told him she had a full time job and wasn’t going to quit that one and that she was just looking for a part time position. He was fine with that and and told her she was hired. She thought this was a bit strange because no terms had really been discussed. She didn’t hear from him again. A few days later she received a check for almost $4000. There were no other papers, explanations, or who it was from. She called the bank this check came from and also her bank to find out if this was a valid check. Both banks said yes it was valid. She had no idea where it came from, but after talking to the banks and finding out it was a real check, she deposited it in her account. Her bank told her it would take about 3 days to clear but could give her a partial amount of the check. So she preceded to buy much needed groceries and was excited at the thought of paying off some bills when the rest became available. Remember, she had no idea what so ever where this check came from. At this point the conversation with the man she had spoken to, never entered her mind because they hadn’t spoken with him after their last conversation a few days prior. Then the other shoe dropped. This man called and asked her if she had gotten the check sent through fed ex. He told her $600 was for her. Then he asked her to go shopping for her for a few things. She told him she had to wait for the check to clear in a few days. He asked her if they had given her a partial amount, to which she replied yes. This person, then asked her to make a Walmart to Walmart transfer with the money she had received. At this point, my daughter realized she had been scammed. She had spent $400 on groceries, gas, etc. which she now didn’t have real money to cover when the check she had cashed will bounce. She went to the police who could do nothing, contacted her bank, who said they would investigate. My daughter is no a dumb person at all. At this point she feel sick to her stomach, embarrassed and has to find a way to cover this money she spent. This site should absolutely have some way of vetting possible employers. Scammers are everywhere and ready to pounce on desperate people. Be very careful people, this site has no idea who uses their site and you could be their next victim. This is such a good website to find jobs!! I apply for jobs and I don’t ever hear from Anyone!! Can’t apply to hardly any jobs on the app it just directs you to that companies website so you can apply through there. And if you click an application for example target, when it directs you to to the target sign in Page cuz you have to make an account for every place you apply, it coninually blocks the bottom of the screen and asks would you like indeed to fill out the application(you can say no and it will dissapear really slowly but as soon as you go to a new page for the next application step it shows up, anytime you reload a page . Sounds good right ? Well when I allowed indeed to auto fill the application it put horrible incorrect info , it input that I was from some country and state I can’t even pronounce and it filled out all spaces with my address I had to click on each box and delete my address. Useless app. Love indeed, need to come up with a customer support system for question. I absolutely love indeed! The only bad thing I do not like, is that’s there nobody to talk to if you have a question about something. Indeed is a great app to find jobs in my areas. Im only giving indeed one star because of SCAMMERS! other than that its amazing i have found amazing jobs over the past 3 years. lately ive been applying to office jobs and they turn out to be Scams i know its not Indeeds fault but they should berify companies and ads before hand just saying. But i love this Job App cant thank it enough and i constantly recomend it to people looking for work . The distance shifts on its own to 35 miles from selected location. The filtering is unclear and bounces around way too much. Needs some bugs crushed and some easier filtering ASAP. I have found work on this app and love it for that reason. I wish it would not keep logging me out EVERY TIME I use it, however. Irrelevant roles and irrelevant locations show up for a specific job and zip code search. I love this app because it is easy to navigate and fits nicely on the screen. It works just as if I were to go on indeed.com. However, the only thing that I do not like about this app is that it keeps logging me out. I have to retype my login information every time I go into the app and I find this annoying. Please change this in a future update. This app has allowed me to browse for a 2nd job for a while, unfortunately I can no longer create a new job search but that's alright because all the searches I have made already are easily accessible for me to browse through at any time. Overall the best app you could ask for to help you find the right job. Website is good but app needs a lot of work. You can look up the same companies that you can look up on the website but in the app it doesn’t show as much information. For example a company may have 17 reviews on the website but the app will show only 3 reviews. Truly a great source when it comes to career advancement. I am greatly appreciative for these services!! The app somehow uploaded someone else’s resume instead of mine. I had to go through it and then change everything back. Need to fix the issue with having to sign in every time you launch the app! This app was completely useless. Most of the interviews I landed came from applying directly on employers websites. The small amount of offers I did receive from indeed were door to door sales job with straight commission , or MLM companies falsely advertising management in training programs. Honestly, I wish I never submitted my resume. I recommend applying for jobs directly going into companies websites of through word of mouth. Don’t waste your time with this app. You’ll submit 500 applications and only get called back 10 times from door to door or MLM schemes. Deleted my account and removed the app from my phone. Goodbye and good riddance. Been using this app quite awhile. After one of the updates, I have to keep signing in which makes it troublesome each time I have to use the app. Not worth using. It won’t let me upload my new resume at all and that’s awful since I can’t apply to jobs on here with an old resume. I like the app but I wish these companies were forced to take the resume uploaded on the indeed site that we provide. Having to fill out some of these applications is extremely tedious and take too long. Why ask us to provide a resume when most of the companies ask us too? Some of these companies also use that information to build a customer base. I find it funny that some of the companies I applied at have called me trying to sell cars and other services. It’s slimy. It would be so nice if I get notifications just for my job certification. This app doesn’t understand the difference between OT & PT. my mom, after 10 years she keeps thinking I am a nurse. More hospitals need the easy apply option ! I enjoy the different steps you have to go through to develop your resume, and applying for jobs. I am optimistic that I will find work here. So I type in a job function-like for Example, EMT and indeed returns jobs not even related and out of the area I search in.. VERY annoying. This app has a hard time showing me job postings that are relevant to the job titles I’m searching for. For instance, a search for “government affairs” or “government relations” yields results including sushi chef at HyVee, install tech at Black & Decker, restaurant manager, and assistant general counsel. Useless! Great app for applying to jobs easily and on the go! I’ve found my past few jobs through indeed.com and this app! I’ve used this app once or twice before to find employment but since this most recent update I’m finding it very difficult to be able to find a job in my area. I put in the city and state, even the zip code & yet it only gives me jobs for a completely other state that takes a ferry to access. Usually I can tweet the preferences but you no longer offer that in the app. I am highly disappointed as I need to find a job very soon & this is making the process more difficult than it should. Love this app and site! Moved and had a job after just a week! Unfortunately, the boss was horrible when it came to proper payment, so I searched again after a week and found another better job in just a week again. Working both jobs now as a full time on the better paying and better boss work and part time on the worse one lol I love this site! Never had trusted job sites to be able to do anything til I came across this! It’s Great- Except for when it ain’t. So most of the time, I absolutely adore indeed. Ease of application, profile settings and recommended jobs on this have made my job hunt much smoother. However, there are a few issues. When applying, you can’t leave the app most times to check information. As soon as you do, it resets your application, forcing you to restart your application. This gets extremely frustrating when putting in references or job history and you can’t offhand remember your info. Also, I live in Northern California, and every time I get an interview request, it’s time is labeled as MST, but is actually PST. This has caused some confusion in my life, but otherwise, I’d absolutely recommend this app to anyone looking for jobs. I’m loving the mobile app!!!!! Easy to apply on my iPhone!!!! Had a few kinks at first but after the updates its much better. Just typing in my home town pulls of dozens of jobs to put in for. Great app to use. Easy to update resume within it. The only problem I have it logs me out of the app if I close it. I have to type my email and password in every time I use the app. Other job apps don’t do that. There should be an option to keep me signed in. Maybe it’s a bug? The best resume app. Very strong! I no longer can use the app due to latest update, unresponsive and it freezes. First, there’s no way to get support. Secondly, the fricking annoying pop ups “do you want to fill with indeed resume” while applying to some jobs must stop immediately! If I click NO once then why do you insist on asking the same fricking question over and over and COVER 1/3 of the page with that question banner? Secondly a lot of positions posted indicate “new!” When you apply, you’ll find out that there’s no such position or that it had been closed a while ago! So how “new” is new Indeed? does NOT work at all now! I am attempting to fill out an application and the application refuses to accept my data entry and says the question has not been answered. I cannot find a single email address to make them aware of said situation. Awful I wouldn’t recommend them to any one! Easy to use, wide reach for jobs/employees. I love Indeed. It makes it so easy to find openings, and a lot of the time the employer is very professional in the listing and with their responses. I also hate Indeed for one reason, and I highly believe it deserves a 2 Star ratings because of this. When you search for jobs, and maybe you narrow it down to New listings only? You get like 1-5 pages maybe? That’s fine. at the bottom of each page it says “More Jobs...” but on the last page it is deceitful and signs you up for emails. I don’t want those emails, I have never wanted those emails, and I am sick and tired of getting the email just to be opting out of those emails. I get that it’s my fault for mistaking it as a “More Jobs...” button, but really, I just wish they would change it so that I never click to sign up for job alerts. Change THAT button, get rid of it, move its location. Do something about that please. Excellent Resource! Thank you. I absolutely recommend it to all my friends. No one emails me I don’t think this is working. I like this app for the easy apply but a lot of jobs show up out of the location range I choose. And a lot of the time the auto resume fill out doesn’t do much and messes up the application and I have to just go back and fix it. But I do like all the job options and the range of jobs it shows hiring. Indeed is a very good job site but as it has grown, FAST, it has started dumping anything and everything into job searches. The filtering needs improvement. Need the actual job then self not any one else to talk for the job. I think this is the best app out there if your looking for a job. However, since the last update I’m having a few problems. I can’t delete one job search without deleting them all. This is frustrating. Also, the format is harder to follow. I’ve always liked this App but right now I’m frustrated with it. Please fix the delete button. I applied to an office job and got a response saying the position was filled, and if I was still looking for work to send my resume to a lady. She then responded saying she needed a personal assistant, asked for my address and then I received an email saying I got the job then wanted to send me a check and deposit it and pay her bills and get her a plane ticket. Indeed truly, is the All-in-One site to look for employment. It seems as if they are actively looking for the jobs that are out there to post. I also like that I can apply easily when I want to, right from my phone. I am really disappointed with indeed. I’ve been unemployed since April and have sent over 300 resumes using the indeed app and have only had a few replies (5) and unfortunately did not get the jobs. But I downloaded the Craigslist app for job searches and sent resumes out and within 30 minutes, had 4 replies and calls setting up interviews and landed a really good job. Indeed what good are? Really. Thank you for creating this app! This is far and above the most convenient job hunting app I have used. Great formatting. Great job recommendations too. In my professional opinion this is one of the best apps to use to find a job in major urban areas. I have had numerous job successes from using this app! 10/10 ease of use! I enjoy this app and it has served me well during my job searches. But one thing that TRULY annoys me is the inability to “omit” certain jobs from my search results. It’s both irksome and hassling to have to constantly trudge through tons of jobs, many that aren’t appealing at all, during my search. An option to omit these from my view would be 5 star worthy “indeed”! Ha, see what I did there? EVERY time I try to use this app it says “connection error.” I don’t have any problems with any of my other apps not being able to connect. It’s very aggravating. Usually I love using this platform however currently experience crashing of the app, under wifi and cellular usage. I can not click on the keyword or description without it crashing and saying I can not access indeed right now..Any suggestions? We need to hide positions and companies. It’d be nice if we had the option to hide positions from a company that’ll post 30 jobs every other day. For example, I see there’s 15-20 new job listings and I go to check them out and they’re all from care.com. I particularly don’t care to ever apply to them much less do I want to see two dozen temporary positions listed from the same place over and over. We have the option to be notified of certain companies that are hiring or certain positions so why not give us the option to hide them too? How can a person tap on “apply” for exactly what he or she sees and have employers constantly emailing you and calling you offering something different? How can you (Indeed) allow employers to have a “quick apply” when there is no such thing? Without confirming days, hours and pay? What a complete and frustrating waste of time. Thanks to Indeed, everyone job I have worked is because of this hiring website. It never fail me. I’m loving the updates and I love the fact we can creat our resume on here. Very simple! Thank you indeed ! My only complaint is the filters. I would like it to have the same filters as the actual website. Most importantly the salary filter, would be nice to be able to narrow it down to what you’re looking for in pay. This is the single most clumsiest website on the internet. I can believe this company can take their website seriously. The functionality is atrocious. I can back this up with details but I’ve already wasted enough time on Indeed. Absolute garbage. A lot of scammers out there, no real jobs available and just want a candidate pool. People need jobs now not later. Should not post unless jobs are available now and they are interviewing actively not just when they feel like it, despicable employer behavior! The interface only allows for those searching for jobs to use the app. I posted a job and then downloaded the app, hoping to be able to review all my potential applicants, but to no avail. Hopefully the app developers will add in the ability for employers to be able to use the app, so they will have the convenience that’s others will also have. Indeed has really helped me out with my job searching. More than 50% of the applications don’t even go through, I applied for more than 30 jobs and I got only 2 replies. And I was rejected for a job on indeed, but when I went to the same company and applied in person with the same resume and letters, I got the job. The idea is great and has some of the best listing for jobs. Easy apply is a great feature. There is some issues such as create or sign in with Facebook which just sticks at success with a loading screen. Other issues involve looking at the next page of jobs just throws you to the top of the first page instead. While the idea of the app is nice, it is just doesn’t compete against other apps in its market due to issues. Why my account always automatically logged out by itself? Every time I look up for another job I have to sign in. Fix this! The process to apply for jobs is too cumbersome. Why should it take nearly three hours to submit a simple resume, which is cause by a extremely lengthy requirements process including required info that’s already in the resume, numerous other entry requirements and a 30 minute questionnaire of repeated questions asked various ways? Are you trying to help people get jobs are is your intention to weed people out of the application process? Makes no sense. Hiring or looking it’s great! Wonderful app that is easy to use and easy to upload your resume! I’ve had Indeed for about a year and the app for a couple months. It’s super user friendly and there is always a ton of job listings. I’ve gotten a lot of job offers and interviews thanks to this app. I totally recommend it, if you’re having a hard time finding a job or not. Best app and website for jobs hands down ! This app is good. But when you want to find something permanent it can be hard. Even when you state no temp work that seems to be all that contact you. Please try to add a no temp tab or only these jobs can contact you? Thanks. Indeed.com is by far the best job search website and phone app I have used to find the kinds of jobs I am the most interested in and qualified for. Indeed.com also makes it extremely convenient to apply for the jobs I want by allowing me to upload and/ or edit my resume as needed and by using one click to apply for almost any job. without. I’m simply astonished at the variety of work that’s out there. Frank Kryza, AB Yale 1972, MPPM, Yale, 1982. Every action gets you subscribed to some kind of email. I’ve had to unsubscribe daily. It would also be good if filter could be saved or if you can filter and search at the same time. Would be great to be able to swipe to dismiss job postings that you’re not interested in to help clean up your search. Also, if you’ve already applied to the position, it shouldn’t keep coming up in searches. I have gotten hired in different fields due to Indeed I really enjoy this helpful app ‘ back looking for a job again! Indeed is an excellent tool for introducing me to real opportunities in education. I appreciate your help in making my life better and more professional. Thanks Indeed, your help has given myself the confid bee, courage, and determination to make my life’s work beautiful and inspiring. It’s so easy to apply for jobs w this App. I have been out of work for two months and after applying to more than 100 jobs in my field of work I have not receive one callback. I’d be better off walking there and applying. My account uses Google sign in which doesn’t work when you select it. I contacted support and they blamed it on Google even though the app never gets past the main login screen. Makes it fast and easy to apply for the job you want. Same old job hunt app in different brand form. Does not solve ANY job hunting struggles. It’s just packed with bunch of ads for jobs and that’s it. Update: as both a current employer and a former employee.. Indeed is wonderful. Zack Ahern, from client retention, has helped me grow my business and find employees. **************************************** This is my first time searching for a job online. I had no idea where to start. This app has given me dozens of options. It's quick and easy and I don't have to Jo through all the gimmick adds to find something real. I love this app I feel way more confident using this app to get my resume and score that career I'm looking for. Great job indeed thanks for the lovely app. I can’t believe how easy it is for people to use indeed to scam other people now. This is supposed to be a job source but sometimes scammers have access to find people’s resume and email them about fake jobs postings. Come on indeed we need more security. I almost got scammed twice. And ironically they have nearly the same excuse and same procedures. Good one but I know better. Thanks. I love the search and filter functions. It has made looking in a particular field and location so easy. Other apps I’ve used aren’t nearly as good with that. I’ve tried applying to a couple jobs on the app and it crashes halfway through every time. But at least you know whose looking for employees and it’s actual decent jobs (unlike zip recruiter) with reviews on employers before you apply. Good luck! They try to scam me saying it was for a job, I was so disappointment at this. I find most companies never receive your resume. Easy to apply to jobs and include your credentials with no hassle. Thank you Indeed!!!! Unfortunately indeed has had a lot of issues with the assessments and app freezing, maybe they will look into this issues, also iv been contacted by fake employers really not cool that they don’t verify employers are actually legitimate business. Beware!!!! Great and very convenient app! Indeed is a pretty nice app. With that being said, I wish there was a filter for jobs on it. I mean I get 10-15 emails a day about someone having interest in me. But it’s all from temp agencies!! It’s kinda ridiculous. I also don’t like the new update where I can’t delete any messages now. I have 100+ notifications now and I wanna try and look back and see who they are from but it’s hard to when I have 100+ and can’t delete the ones from the temp places. I hate this app. It literally shuts down in the middle of me applying for a job and it never seems to send my application to anywhere because when I call the company for an update they don’t even know who I am. No record of ever applying so I just don’t think this app even works. I’ve never gotten any response from anything I’ve applied to. I’ve chalked it up as me wasting all my time practicing to apply for jobs. I am only 14 years old and this is the only app that found jobs that I can actually apply for and get reviewed and have a chance. I finally got my first interview and the person knows I am 14 with no experience. If you're looking for a job you should definitely download this app. Completely worth it and its easy!! The app keeps glitching every time I try to search. It won’t let me search it will glitch freeze up and restart. I use this app a lot and had plenty of successful interviews with jobs. This app was really easy to use but now for some weird reason or another it’s difficult to upload a resume on here. If we could fix that I would definitely recommend 5 stars to anybody. Ps. Keep up the good work though. Apply over 50 Jobs a day !! An don’t receive sht!!! Indeed is a good job seeking app probably #1 I just dislike certain things about it. It’s so annoying, how am I supposed to look for jobs just in my area if you give me the jobs in the town 30 mins away from me mixed in! As I was applying for a job that I really wanted, I noticed that my resume had completely changed because of the app. It looked worse and now there goes my chances of getting the job I wanted. Beware! Lots of scammers pretending to be legit employers. I think Indeed needs to really try and screen out the scammers. There is a section where you can report it but yet I still encounter these scammers. Indeed needs to step it up a notch and find a way to really weed them out. It’s annoying to have all my info on indeed but when redirected from some postings, you must input all info manually because indeed doesn’t auto fill nor export it to third party’s site. Waste of time. Lots of other small issues to fix. Like keeping the filter options I choose every time I go back to home for a new search. Most job offers aren’t mobile friendly. I was looking to jump in and take step forward. Like getting out of the typical teenage job and going towards some office experience and Indeed made it easy to make a resume and after that I was able to send off applications faster than I’ve ever done! It’s been fun making a difference for myself and landing interviews. I like the fact I am able to find postings from several different sites on one website! It’s become so glitchy I can barely use it! It freezes, crashes, and gives me endless problems. The indeed site is wonderful, but this app needs work! Awesome Real Site!!! Real Results!!!! I’ve gotten Great jobs thanks to Indeed!!!! Very well subscribe to buy employers, so there are a lot of jobs. Many cities, different fields and the searchability helps narrow things down. It even prompt you to make a resume and easily digestible form although for me this was an adjustment. Good stuff all around! Needs more options to customize search area. They advertise the fact that they use screener questions. If you apply for a job and your answer is no to a qualifying screener question you might as well stop applying. You will be kicked instantly. Also quick apply doesn’t work properly. Indeed is a waste of time for anyone without a traditional 4 year college education. Technical skill is irrelevant when using Indeed since companies filter out any applicant without a bachelor’s degree or 2 years experience. Without a bachelor’s degree you won’t even find an internship let alone 2 years worth of experience. I’m not sure why Indeed shows jobs outside of my city or zip code. If I search for something in my area I don’t want a job listing an hour away. Please add a radius option. That will make this a 5. I didn’t know what to expect from this app - it always seemed kinda iffy to me. Just thought it was something advertised that I’d never try. But it really is a great app to use when you’re looking for a job. It’s easy to use and give it 5 stars for how it’s designed. Good app but if freezes every time I try to apply at a job with a pdf file on Dropbox. This is the best job app there is. I don’t use anything else, but the last few weeks it won’t allow me onto it unless I’m in WiFi. Every time I try getting onto it using my data (even having full bars and LTE) it says the servers are unavailable. Can this get fixed please? Great with alerts. Good information for job seeker and employee seeker alike. I have not received any call backs from this site. Why is it sighing out by itself? I am an on the go person and at times I am too busy to go job to job searching. Indeed has given me the opportunity to search for employment while not interfering with my busy life schedule! Also I am planning a relocation over 3,000 miles away and I am able to apply for jobs in my future destination from my current location! Very convenient! A great way to search and apply for jobs! Easy to use. I love the tracking tool! Have gotten two of emails and one call so far in just one week. I used to love Indeed but now I will no longer be using it. Twice in the last few weeks, two job postings turned out to be fake. People making fake job postings to try and hire people with make fake, fake everything. It’s fraudulent! Even when I do get job recommendations, most of them are not jobs that match my resume and not along my field of expertise. Indeed needs to look into these issues and fix them. Especially the fake job postings!! I’m tired of being serious about finding a job and this crap happens! It’s a pretty good app, but you should be able to block certain companies that you don’t want you showing up in your feed. I get tired of looking at the same ads over and over. I know I will never apply for those, so let me block them. Thanks. Sometimes its difficult to find a job when going out yourself. But on here you get notified and recommended job positions that may suit you. Really recommend people use it. This app will give your info to anyone who wants it, you will find that it is riddled with scammers disguised as employers. I would love to see a option at the moment that I’m searching if I love the job or no... let me explain: if i don’t like the job or doesn’t fix my profile I would like to be able eliminate it from my view and the searching will be more enjoyable... Thank you for this opportunity. Would it be possible to add a search option to not show sponsored job listings? Thank you. I love indeed as a company and it’s a go to when I need work but the app hasn’t been allowing me to view messages from employees and doesn’t have a way for me fix it myself. It’s so annoying. Always keeping my eye out for the best job and indeed helps me do just that. I love Indeed. LOVE! But the app is not so great. My biggest issue is having to log in multiple times a day. And I have two factor authentication enabled so it takes even longer and on several occasions the texts to log in didn’t come through for up to half an hour. Also the display of “next steps” doesn’t line up with the screen so as you scroll through, the steps get cut in half by the screen edge and you can’t get them lined up. Plenty of jobs on this app. There “Apply Now” button some jobs makes applying quick and easy. Easy access usage through the app. Thank You for your convenient assistance in helping me find a variety of jobs to suit my lifestyle and interests. It’s easy to use. I got Interviews the day after downloading the app. I love this app it’s very helpful! I don’t look for jobs on no other website ! The app would not let me continue. Wasting a good amount of my time. Very easy to apply and the site helps a lot, but I haven’t heard anything back from jobs. Haven’t heard anything from jobs, have applied to maybe a dozen. Attempting to login to google, Apple, or other applications doesn’t work at all. Attempting to apply and unable to apply is so frustrating. Thanks for wasting my time indeed. Haven’t found a job yet because of this app. But it seems promising. I enjoy using indeed to look for jobs. Definitely needs to be an easier way to apply to jobs that require you to go on their site since the whole point of this is using this site to apply. Signed up for this site , got employed the same day with another source. I cancelled my account and I’m still being charged $20 a month , I’ve emailed them, called them and still have not gotten a response. They’re customer service number does not prompt you to a representative so it is useless. I’ve used this app several times and I have landed a couple jobs; however, the salary listed never matches what the employer actually offers. For instance, one listing stated the position included 60K guaranteed but the position instead was commission only. It looks like most of the jobs on this site is unrealistic I mean it doesn’t exist anyways this job site wasn’t helpful at all. Indeed has real jobs that get back to you As to why u r not qualified. Fastest rejections ever ! Old messages clog up inbox! This app is great but there needs to be a way to delete old inbox messages! Love indeed but I’d like to filter out jobs by salary. The search results never pertain to what is written in the search box. This, if possible, has gotten worse! Also if a job doesn’t apply to you or you are not interested why can they give you the option to stop it from showing up in your searches again and again. Ex everything I have written... I wrote that I was looking for an accountant position and the search results pulls up a delivery person!!!! How backward is that!!! Thanks for helping and giving us a free App when we actually need! Hardly Anyone Calls You Back About The Jobs You Apply With Let Alone Sometimes The Places Aren’t Even Hiring. Overall the app is amazing I have no complaints other than I’m no longer able to search for work in other countries. I currently live in New York and I would look for openings in other countries such as Canada or the UK from time to time because I’m considering on moving to those said places. As of today I don’t see the option to do so. Why is that? Could anyone help please? Thank you. I think this app would be better with more precise jobs linked to the area code you choose to use. If you are looking for a job near you, other jobs shouldn’t show up when the jobs are so far away. Hands down the worst job seeking app out there. I’ve yet to see a single legitimate lead, and my email and phone number are both now constantly assaulted by spam and scam. It’s use is nothing but getting people’s hopes up and just ends in another scam. This app would be great if it truly were easily apply. We spend a lot of time creating our resumes. We shouldn’t need to be transferred to several pages, third-party HR service or employer site to apply. I have submitted many applications and still stuck in the same dead end job. I used to get excited when I got a notification that a company viewed my application. It seemed promising. But after several views and no replies, these notifications don’t mean anything to me anymore. Maybe it’s the region where I live, but I don’t see how after three college degrees and 18 years of work experience, I still struggle to make over $17 an hour. Maybe college was a lie. Stories of all the doors a degree would open for you don’t seem to apply to me. All I have are thousands of dollars in student loan debt which I could have avoided it I had just worked in a warehouse right out of high school (yes, I know people working in warehouses with no college degree who make more than I do). Apple requires me to say more to submit a review. This is dumb. Although instead of running around you find yourself in a job App that doesn’t focus on where you are OR one that that just takes jobs who make you RE-apply through them. I don’t understand how this app can ask you for a resume only to ask you to re-apply through others. Sometimes making a resume makes it easy through others but nine times out of ten I have to RE-apply through their website. Please indeed fix that issue because most of us are interviewing a company while they interview us and in all honesty I can’t accept them being lazy. We came to you for job postings that would make this “easy” instead of filling out one hundred extra applications and you’ve done some people like me less than what you offered. Please fix your grueling mistake. I’m very grateful for all the job possibilities that this app offers and it’s been my number one tool when looking for work. Takes a lot of the work out of finding a job. My favorite site to search for a new job. I usually get One call out of 25 resumes submitted and I have a great resume that matches what employers are looking for. I’ve never been hired through indeed. Still hope-full but kind of a confusing bummer. I mean, this app help me find a job in less than a day. So that should say something. I keep getting recommendations for bilingual positions and/or medical positions. I AM NOT bilingual nor am I a medical professional. The app background is white, which is sooo bright at night and hurts my eyes. PLEASE add options to switch up the color to something darker or neutral at least. Thank you!!!!!! My only qualm is with the mile radius search. I have mine set at within 25 miles yet regularly see results that are hundreds of miles away. Just a little inconvenient when I see a perfect job that would then be an hour(s) drive! But otherwise the app works awesome! Very buggy, a new window keeps popping up after I dismiss it and I can’t get anything done here, useless! I see notifications on my phone and it literally takes hours for it to show on my messages on indeed.com. It is very inconvenient!!!!!! This glitch needs to be fixed because I will not use this website anymore if it doesn’t. Someone who needs a job asap can not afford to wait hours to read a message from an employer. I love indeed I’ve gotten all my jobs in the past year on indeed but I cannot open my messages I always get an “unknown error” message. Which is super frustrating being that there are jobs contacting me that I can’t reach back out to. I’m a security guard with 4 yrs experience now indeed has allowed me to really reach high levels and always have terrific job options. Always feel like I’m wasting tune bc I have never heard back from potential employers. Even from Positions that I am well qualified. I dislike the ability to check the status of applications and the availability of previously posted jobs. This is no fault of indeed. However, indeed is very helpful in finding opportunities to apply for. Thorough in breaking down details of postings and at the forefront of career search in comparison to other job finders I’ve tried. Very easy to apply for jobs through the app but some employer websites require you to be on a PC to apply. Every time I update anything, the app logs me out. Aside from that, it’s about the same as using safari to access indeed.com. There’s not a lot of difference in functionality, from what I’m seeing. So, it’s an ok app. It does what it’s supposed to, but is a little buggy. I’m not looking for bells and whistles with this app, so I don’t dislike it, aside from being logged out constantly. Ive always gotten scam calls, but after I installed indeed I started getting texts too. I had to put my number on the national do not call registry. Also the consistency of the interviews you get are all over the place. About 10% of Jobs you apply to via Indeed will get back to you in my experience. It’s an ocean of jobs and that’s not necessarily a good thing. They keep jobs posted that are months old and long been filled. I’ve had interviews but haven’t been offered anything which isn’t really Indeed’s fault, but the sheer number of applicants makes it a cut throat setting through this app. I’m deleting this app because it’s getting me nowhere. Indeed is geared more towards the employers, rather than applicants. The website doesn’t provide the ability to access employment tracking tools, for the applicant. It doesn’t require the employer to provide contact details of the recruiter or hiring professional, so that follow up contact may be pursued by candidates. It’s clearly a very one-sided job search site. Serious improvements in favor of the candidate, equality and transparency need to be made. At best, this is an inadequate site to look for a job or career. This app is giving me trouble where I can’t access it immediately, also I don’t like the fact that I have to verify everything I change in my resume. Change that as well. It has been really helpful!!! Poorly ran security on app. A LOT of fake jobs are allowed to go unnoticed on here. This will lead to your resume and the personal information therein being sent out to said people posing as legitimate workplaces. I like how you select specific job for my field but I don’t like fact that you keep bringing back the same jobs I applied for already! And another thing, you keep sending some jobs that are not related to IT which makes wonder why you do that!That’s why I gave you three. This app is excellent I appreciate the fact that you can apply from wherever you are! Awesome site ! Easy to use and 95% guarantee of finding a good job. I don't really write reviews but I use indeed every night before I go to sleep and one thing I noticed is that when you filter your options when applying for jobs the apply from phone option disappears sometimes. Even if I exit the app and clear out all apps it still doesn't show. Please fix this!! There seem to be lot of job postings , that want to hire and then fire us citizens ..
Really accurate and reliable, fast and keep the positions updated. This app really helped me a lot . Applying for jobs on Indeed is so easy. Receiving regular notifications of new positions is great! Hate having sponsored company’s pull up on the search results on every page when your on your mobile app and only get like 10 results per page. Also the phone interview part is annoying when it’s the same questions every time can’t we just pre record out answers then since the company’s can’t come up with there own questions? Indeed is a great service from what I can see. There are things it lacks in terms of features, but overall I have a good experience. However, just recently they redesigned the UI to match the trend of being "large and clean". Nearly every menu and search recommendation you can click is now larger and way too clean that it just looks ridiculous and unattractive. It must be appealing to the blind, but it should have a font sizing option if they are going to push more scrolling to see more content. Because the update must be over a cloud or web-based infrastructure, there is no option to just stay on the version you've been enjoying right now if you're one of those people who doesn't like every update developers push out. It does its job but the UI needs to go a bit backwards to move forwards. Update as of 6/28/18. The UI is only getting worse. Even more job cards and it takes a bunch of side scrolling just to edit filters for searches. The All/New tabs for search results has also disappeared. This service only becomes more inconvenient. I like this app, but leave the distance where I set it. It gets old resetting every time I’m searching for a job. this app just keeps automatically signs out my account. stop it. Can’t adjust distance for job search anymore. Ridiculous. Some of the buttons don’t work. I try to press submit my application and it’s just unresponsive. Over 90% of jobs don’t list a salary! Do they understand how jobs work? I perform a task, the employer pays me. They are only doing half the job. They tell me what the employer wants the job holder to do, but not what they are willing to pay. It’s inane. If a job sounds like something I am qualified for and would like to do, I have to go through a very time consuming process of applying and providing personal information, then communicating via email and phone to set up an initial interview, then find out that they are willing to pay nowhere near what I consider a fair wage. Everyone’s time is wasted! I get that many employers are unwilling to pay for quality and are hoping to snag desperate people for pennies. So if they want to pay Indeed to list a job with no indication of compensation, Indeed is going to take their money. However, I would like Indeed to provide me with a filter so that I can choose to only view jobs that have salary information. Also, it would be nice to be able to exclude companies from results. For example, if I’ve already been declined by a company, I don’t want to see any more jobs from them. It’s a waste of my time. Further, Indeed’s keyword searches are not advanced. If the word manager appears anywhere in the post, for example: "you will report to the store manager", it will show up in searches for manager jobs. I have been using Indeed daily and have been unemployed for 20 months. 85% of companies that list on Indeed will NEVER contact the applicant at all. Of those that do, 99.9% send a form letter denial to applicants that meet 100% of their requirements. No interview, no chat, no follow up questions. Just a flat denial with no reason given, so no way to know what they may not have liked. There are a ton of job listings on Indeed, but it appears there are no real life jobs. I recently was using this app where I can see where all the jobs I applied to and this morning I checked them out and they’re all gone! I can’t even check the descriptions of the jobs I applied or look more details about what jobs I have interviews for. I don’t know if it was a update or not but I’m not satisfied anymore. I’ve been using this application for a while to find something full-time in my industry since graduating. I think this app has a lot of potential but is lacking a few things from both the employer and employee side. First, I believe it would be ideal that you add a feature to ignore or hide jobs that are either not relevant/applied to/not interested in. It is a bit annoying to constantly see the same job every time you are on that maybe you aren’t qualified for or seems like it’s more on the sketchy side. Second, I fill out a lot of questions for each employer. Some more than others. Some less than most. It is frustrating on anyone’s end to see a job in location a when you are in location b but want to be on location a. I’ve applied to jobs in other states fully prepared to relocate at my own expense but get told we are looking for someone local. Every job outside of a certain radius of our location should ask if you are willing to relocate and if you are looking for relocation expenses to be paid. This would be most ideal for someone who wants to move but gets shot down by the employer because they think the person is just wasting time or unaware of the location. Third, if I send a resume out to someone and it states that you can not contact/email/etc, then the least that employer should do on their end is notify said person that we got your application or that they are going with another candidate. More companies on here are doing so, but many do not. It would be nice to know if someone is on the other end. After a month or so, I figure it’s a lost cause. Lastly, I feel that is should be required for all employers to post their website/job career page in the post. I enjoy being able to find the actual job posting or company to see what their policies are or to check them out. Some of these companies posting on here do not seem legit and it would be nice to know that from the start. I love being able to apply to jobs on my phone. Not having to open my computer every time I want to apply somewhere is great! Also the app opens from email so I can tap the link and go right to the job. Indeed also tells me if I’ve already applied somewhere. This is highly useful for a forgetful person like me. Why can we no longer save or download our resume onto our phones? Really needs more improvements like more filters when searching for a job. The app is not consistent in accessing Dropbox when I attempt to upload my resume. Also, after completing numerous fields of employment info, the app freezes when submitting the info, then the info disappears, unsubmitted. I have to continually stop and just access the site on a computer, making the app a bit useless. When it does decide to work, it does so beautifully. I just want to say thank u so much for everything you,be done for me , you deserve the glory in GoD name amen! No way to share resume??? I have an employer wanting to see my resume right now and I'm not at home. I searched desperately for a share button or link to no avail. Or a way to download it. Nothing. It’s a public resume. A shareable resume seems like a must requirement for a job search app, so this app failed me when I needed it. Found a very specific creative job on this site, exactly what I wanted. Been working for the company two years, got promoted, now I’m looking again for a change. Simple but solid engine. Indeed sends alerts continuously. They have my resume and send me alerts which coincide with my skill set. There isn’t any manipulative emails or false coercion tactics. I’ve applied to numerous employers who meet my career desires. I can highly recommend using this job application. Great the lab if you want to supply unemployment with the correct documentation but I don’t really wanna work. Traphouse all the work I want to do. Anyway got to feed her and Quan ,Jamela ,a Ronja low, And La Manja low. This app is amazing if you are looking for jobs. I applied to so many and heard a lot back. It would be my first job but I got hired at a company I’m starring next week and the pay is $12.65/per hour. I LOVE THIS APP! Definitely going to use it again when I am looking again. 10/10 would recommend. Best job app out there. I just recently downloaded this app & it keeps crashing every time I start & application. You can’t see things in order by newest to oldest, the dates are all out of whack. You can’t pick smaller parts of the city like on the website. 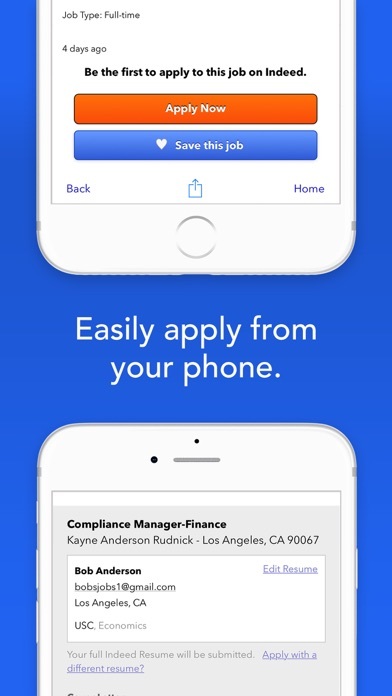 A job listing app that doesn’t recommend appropriate jobs (compensation wise) or give the user the ability to filter by salary. How could it leave out such a fundamental feature? I’m new to this process & am having a great time learning to navigate through all of the options! I’m hopeful that I will find the right fit for me as I retire and make my way around a new trail! I’ve had some difficulty during one of the assessments and Indeed has been very quick to reply and offer assistance! The app works decently, except for when you have to log in EVERY time you load the app. Why can’t you stay logged in? That is honestly my only gripe. Constantly needed to sign it. All I did was a simple email change, and my account completely disappeared. All my saved jobs, applications and their status, résumés, etc. I sent message after message to them (no tech support line) with no response whatsoever. I loved this app until the recent updates. While I understand they are trying to make money, I see mostly sponsored ads (the same ones over and over as I scroll down). The sponsored ads are typically old and never yield results if you apply. The problem now all of a sudden are job postings that have nothing to do with my search, fake jobs, and companies you can’t find to really exist. There are some real jobs listed, but I really don’t like all the sponsored ads to weed through. I’m going to look at other job boards in the future. I really like the new format for Indeed.com but I must say that my recent searches for night employment is very limited due to the fact that all jobs are included in this search. It would be really nice to have sections for strictly night time employment and perhaps a shift section (days, mid-shift or swing-shift, and overnights or 3rd shift) I would think this would simplify the search results, just my opinion on the subject. Other than finding it difficult to narrow down my night time employment options and section s to do d them, it has been a good experience overall. I like the user-friendly format. It’s easy to do more than one search. For example, a ‘Help Desk’ search & a ‘Technical Support’ search. The jobs on here are no even accurate y’all should be shut down. Indeed is indeed the best! Best site out there for jobs! This is the best job search and apply app hands down. Highly recommend! Go back to old layout - this is not an improvement at all. Font size is too small and grey color on name & location is also hard to read. Unless I’m missing it, there should be a way to filter out duplicate listings! I only care about the most recent one. I don’t need to weed through 4 or 5 duplicates from the past. Needs more explanation of if it’s morning evening or nights position.would be more helpful. Every time I finish applying to a job, the job description pops up again and again when I’m browsing and it’s getting real effing old. Tried to apply to a cleaning job and then a previous job I applied to or clicked on to read pops up out of nowhere. Do you people not try to catch these bugs on purpose? Weak. The new update 9.4 drastically changed the app. The homepage/search changed for the better, kind of. The job list has too much going on, it doesn’t make job hunting easier. It’s rather distracting. I understand that some employers would not be able to post ads without salary included. However it is not professional to advertise x amount as a salary due to "law of averages" or "top earners in the past". This is false advertising to the applicants who get conned all the way up to the interview. Imagine showing up in your Hugo Boss suit because you think you're interviewing for a $75-85,000 a year Account Management position... just to find out it's a group interview for seling life insurance door to door at 100% commission based pay. "Paid training(performance based)" means no guaranteed pay. If there is no guaranteed pay, it is false advertising to allow these employers to present them as salaried jobs. Indeed job market is flooded with BS sales position disguised as "setting you up with your own business". It is becoming a field of door to door, or retail face to face commission based jobs. "Direct marketing" is also the new guise for door to door. It is pretty disgusting. As the leader in the field, you should feel obligated to improve the overall quality of the employers you allow to post jobs, especially ones with fake salaries, lies about health insurance and benefits, and allow them to only create ads in their own "performance based, commission only, no benefits, direct marketing" circle of nonsense. Do your part. Help clean this up for the hungry applicants and employers who want to work. Thank you. I don’t feel as though employers are seeing my profile. It’s definitely the easiest w At to look for a good job! I was trying real hard to maintain the integrity of my stature when the stupid app kept forcing me out of the home interface asking me to write a review! Besides... I guess this is a decent job finding app for teens with none my age! But good one on annoying me indeed.... NOT very satisfied! Best Job Info Bar none!!!! Only place to find a job, Period!!!! The jobs here are not always a good match but the ones that are I never hear back from. I know I’m not the only candidate applying but it’s just so strange why I have yet to hear from any of the jobs I have applied to Not one. This used to be such an excellent app, until they stuffed it with "suggestions" and maddening notifications. If you are going to relentlessly spam people--at least get your algorithms right. I get this is about stuffing your bottom line, but I for one am now on the hunt for a different search service to use. You pretty much destroyed yours. The results are in and Indeed is my only option for finding myself and my clients great full and part time jobs!! Almost every single job requires experience in their industry. Most companies have a name not necessarily recognized by all. It should be in the initial search results that you are looking for a rocket scientist, Doctor, software tech, engineer, rather wait to read that later in the fine print. I like the app for the most part, but the sponsored posts are really turning me off of it.. I see the same posts repeatedly with only a couple of new posts in between. Most of these aren’t relevant to me and are just making it harder to look through listings. There should be a way to hide postings that you aren’t interested in. Very horrible app. Doesn’t let me upload my resume it constantly crashes when I’m applying to various jobs and it never notifies me of certain jobs and new openings. It was working perfect at first but it needs to be fixed, the fact that I couldn’t upload a resume without the app crashing is annoying and really stressful when your trying to get your application done as quick and efficiently as possible. The searching results always come out with a lot of relative job roles, but which are not what I expect. For example, when I searched for an “iOS developer internship”, it always came out with a lot of “Sr iOS developer” positions, sometimes even came out with some Web Development positions. Work really great highly recommend it!!!! Indeed is awesome, however, I hate that I have the option to send my resume as my application and then STILL have to fill out a 30min long application! Keeps telling me my phone can not connect too this app. Brand new iPhone. How do I get a previous version? Version 9.4 doesn’t work. No way to update after filter change. What was wrong with the last version?! Very helpful and easy to use! I absolutely love indeed. I went from making $10/hr and no benefits to $15.50/hr for doing the same type of work. Closer to my houses. More professional atmosphere and management. Full time work. Holiday pay health benefits and much more. In April I just celebrated 2 years at the job that indeed helped me to Get. I gave birth 4 months after starting the job in 2016 and even without FMLA I was able to get short term disability for the entire leave (8 weeks) to help pay my bills while I was off. I feel so blessed and I owe it all to indeed. The app is awesome it makes it super easy to apply quickly to several places at a time. The new update is cakes!!! Areas of town that I am interested in! When I put in my zip code your system looks for employment opportunities in the greater Nashville area and Brentwood. When I tell it how many miles from my home I want to work, it ignores my input. When I say Spring Hill, TN, I mean Spring Hill, TN. Updated with 9.4 and every time I close the app or exit the “distance” filter resets to 25 miles. Also the “sponsored” listings are getting out of control as I have to go to the second or third page before I get to postings that aren’t for National or other places in the state. When posting my resume in the system, it constantly moves dates and information around. The app worked great but it was updated and now when I search jobs near me it brings up jobs all over the country. 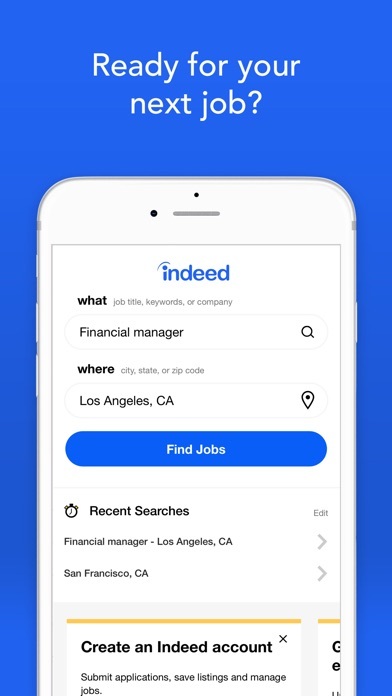 Indeed is amazing application ,and it easy to use to find out a job.and anyone can navigate easily through Applications. but what I like it to be updated in the application, it is country field in profile some of them not available when I want to fill the application form . And also every time I need to apply for a job I suppose to create new profile , because indeed profile will not uploaded properly in other agency job application , there are some modification and amendment need to re - build again in indeed job search. I'm not sure if this app works or not. I've applied for iver 30 jobs and haven't gotten one call. So either the employers aren't seeing my applications or the app just doesn't work and they are compiling our information. I made a resume. Anytime I click yes to filling out with my indeed resume it says it filled out x number of fields but all fields remain blank. Total waste of time. Indeed offers a very straight forward and easy to navigate service. I am very satisfied using this service. APP KEEPS CRASHING. I’ve downloaded the app twice! I continue to get an error message that says I have no internet connection! I use all other apps just fine and my service works well. This used to be my go to for my job hunt but within the last few months I've noticed a lot more sponsored postings. I'll search for jobs and there will be 30 or so pages of listings but when each page has a minimum of 5 of the same sponsored post its really cuts the real search matches to maybe half. Sponsored posts most often don't even match my search terms. I'm tired of scrolling through pages and pages of paid job postings that have nothing to do with my career field. I'm deleting app and using Glassdoor, LinkedIn, or just going directly to company sites; at least then I'll actually see relevant unique postings. Latest update takes away ability to save jobs. Now it’s worthless. This has no reflection on the website. Honestly using this app , I couldn’t find any jobs that is for teens. And when I search for teen part time jobs, all the recommends, none of the jobs won’t allow teens. This site is awesome it kept me abreast all the latest job openings in the fields I wanted. Need an update, I’ve checked the app several times says I have no new messages, no new messages in my inbox on the app, I go online and I had 8. From several days, a few from weeks ago. Need to fix that. I'm deleting this from my phone. It's never able to connect to the server and functionality is near useless when I do use it. Google's job results are far more robust - hopefully they'll develop a native app for that but until then I'll be using my internet browser for job things. I’ve gotten most of not all my jobs through indeed. I only wish it had more recommendations instead of just a few. Other than that it would have gotten 5 stars from me! I have had good luck with indeed. I feel it is due to how easy it is to set up a strong profile and its ease of use. I have been hunting a job through your site since January to now and I’ve just found one but not through any job sites like this! Indeed will help you make a great resume but I never found a job! Yes your site lists all types of jobs but still you can’t get through any of them! What did I do wrong? Anything? I use to love this app but since your redesign it very hard to read, my recommendations are wrong, what happened to the mileage, what happened to sharing by text? Now Glassdoor is my go to job app. This new design is horrible! Please go back to the former design, who wants to keep squinting looking for job openings. Due to some sort of glitch that indeed has in their resume engine, I was subjected to ridicule and harassment from a possible employer.My resume was not at all like I uploaded. There were extraneous characters and miss spelled words absolutely nothing like the resume that I submitted. Thanks a lot. I just took a look of my resume when prompted and there’s no wonder why I haven’t been getting any bites! Indeed has my skill set looking like a kindergarten report card! Embarrassing isn’t the word! This is devastating for my career. I have a huge network and to know that some of these potential employers that asked to see my resume on indeed is now a fix I’m not sure I can make!!! I like seeing what is available to further my career. However, about 90% of the time the app is not connecting! I get an "unable to connect" message when trying to view jobs then I hit the retry and it just keeps going from there. Please fix this! I’ve gotten and found several jobs using this app! Great work! This has been a gate way to employers seeking employees. I have been hired via #Indeed. I'm enjoying the app. I am still looking for a second job! Why is it you always run the same job listing over and over in the same search area?I don’t need to see the same job 5 times in one search. Why won’t jobs I already scrolled by gonaway? Really would make this app so much better. I barely know what is new! This app is great but could use some bug fixes. I get a lot of freezing while I am on it but otherwise it is a great app to find jobs! I have also gotten an interview from on of the jobs listed! Love it!! BUT!!! After the new update, it doesn't stay signed-in anymore. The website produces results. It could definitely be designed a little more efficiently though. When letting my iPad go to sleep and waking it up the indeed job app starts acting up i have to closed down and open it back again it is very annoying because i need to start all over again in looking for the beginning of the job list. This App is good to get basic communication open with possible employers. I find that you need to demand a salary about $(10-15/Hr) higher than you’re willing to accept and then the desperate companies who need employees immediately offer something lower and then you stick to your original salary demands. Trust me, you will be given an offer you reasonably never expected. Companies need employees WAY more than you need$$$.